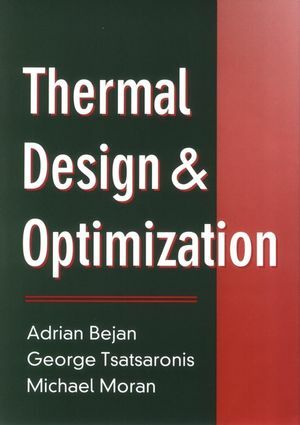 Thermal Design and Optimization offers readers a lucid introductionto the latest methodologies for the design of thermal systems andemphasizes engineering economics, system simulation, andoptimization methods. The methods of exergy analysis, entropygeneration minimization, and thermoeconomics are incorporated in anevolutionary manner. This book is one of the few sources available that addresses therecommendations of the Accreditation Board for Engineering andTechnology for new courses in design engineering. Intended forclassroom use as well as self-study, the text provides a review offundamental concepts, extensive reference lists, end-of-chapterproblem sets, helpful appendices, and a comprehensive case studythat is followed throughout the text. Thermal Design and Optimization offers engineering students,practicing engineers, and technical managers a comprehensive andrigorous introduction to thermal system design and optimizationfrom a distinctly contemporary perspective. Unlike traditionalbooks that are largely oriented toward design analysis andcomponents, this forward-thinking book aligns itself with anincreasing number of active designers who believe that moreeffective, system-oriented design methods are needed. Thermal Design and Optimization offers a lucid presentation ofthermodynamics, heat transfer, and fluid mechanics as they areapplied to the design of thermal systems. This book broadens thescope of engineering design by placing a strong emphasis onengineering economics, system simulation, and optimizationtechniques. Opening with a concise review of fundamentals, itdevelops design methods within a framework of industrialapplications that gradually increase in complexity. Theseapplications include, among others, power generation by large andsmall systems, and cryogenic systems for the manufacturing,chemical, and food processing industries. This unique book draws on the best contemporary thinking aboutdesign and design methodology, including discussions of concurrentdesign and quality function deployment. Recent developments basedon the second law of thermodynamics are also included, especiallythe use of exergy analysis, entropy generation minimization, andthermoeconomics. To demonstrate the application of important designprinciples introduced, a single case study involving the design ofa cogeneration system is followed throughout the book. In addition, Thermal Design and Optimization is one of the best newsources available for meeting the recommendations of theAccreditation Board for Engineering and Technology for more designemphasis in engineering curricula. Supported by extensive reference lists, end-of-chapter problemsets, and helpful appendices, this is a superb text for both theclassroom and self-study, and for use in industrial design,development, and research. A detailed solutions manual is availablefrom the publisher. ADRIAN BEJAN is J. A. Jones Professor of Mechanical Engineering atDuke University. He is author of Convection Heat Transfer, SecondEdition; Advanced Engineering Thermodynamics; and Heat Transfer;all published by Wiley. GEORGE TSATSARONIS is BEWAG Professor of Energy Conversion andProtection of the Environment at the Technical University ofBerlin. MICHAEL MORAN is Professor of Mechanical Engineering at The OhioState University. He is coauthor (with Howard N. Shapiro) ofFundamentals of Engineering Thermodynamics, now in its thirdedition and published by Wiley. He is also the author ofAvailability Analysis: A Guide to Efficient Energy Use. Introduction to Thermal System Design. Thermodynamics, Modeling, and Design Analysis. Heat Transfer, Modeling, and Design Analysis. Applications with Heat and Fluid Flow. Applications with Thermodynamics and Heat and Fluid Flow.